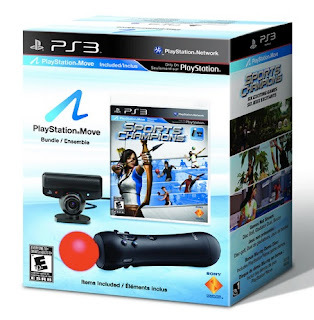 While scanning NeoGAF this morning, I came across a thread about the PlayStation Move pack-in (and, let's be honest here, Wii Sports rip-off) Sports Champions. Being the curious sort that I am, I clicked on said thread--and received quite a shock when I realized that the game was released late last week. (On Friday, to be more specific.) Honestly, I thought the game and peripheral were going to launch alongside Microsoft's Kinect this November. Did anyone else completely forget about the release of the PlayStation Move? Conversely, did any of you pick up the peripheral-previously-called-Gem? Nope. And I don't know anyone who thinks it's a good idea or worth spending the money on, so...that says something. I don't think it's necessarily a bad idea, but I agree that it's hard to see the value -- unless you're just 100% against owning a Wii. Anyway, it'll be interesting to see how well this sells between now and the end of the year. It'll also be interesting to see how Kinect sells. I have a feeling Kinect will be the more successful of the two, but I also think both will drop off a cliff sales-wise shortly after the holiday season. I forgot it as well, but I really don't see the fun in that kind of controls. I take a few precise buttons over a waving-stick any day. I like your blog by the way! I recently added it to the bloglovin-list and I'm currently reading my way back in some of your older posts. I hear what you're saying, starfighter, though I think motion controls, when done well, can be nice. Also, pointer controls are wonderful -- hopefully more game devs will use them in the future, esp. in RPGs. I was at Best Buy when it came out, and was confused. I saw a PS3 bundle that included the Move controller and the eyetoy (or whatever it's called now). But the navigator was sold separately. And based on your photo, the navigator isn't included in that either! So, will developers actually build games around that piece, or is it just a way to trick people into spending $30 dollars extra? You're right, Zigfried -- the bundle pictured in this post *doesn't* include the nunchuck, er, I mean, navigator, nor does the PS3 bundle. Doesn't seem like the best idea to me, esp. if the folks at Sony want developers and players to use it. So, will this one hit WiiWare, too?